In 1990, the U.S. Congress passed the Organic Food Production Act (OFPA). This law was heralded by many as the first U.S. law established to regulate a system of farming. This law can be accessed through the website http://www.ams.usda.gov/nop/indexNet.htm. OFPA requires that anyone selling products as "organic" must follow a set of prescribed practices that include avoidance of synthetic chemicals in crop and livestock production, and in the manufacturing of processed products. Organic certification agencies became established in the U.S. to deal with a required "third-party certification." States, including Iowa, followed suit and established their own organic laws. Iowa passed Chapter 190 in 1990, which defined organic as above, and established penalties for producers falsely identifying their products as organic. Iowa allows private certification agencies to operate in the state, as well as their own state of Iowa certification program, which will be available in 2000. This system is in contrast to the state of California, for example, which relies on California Certified Organic Farmers (CCOF-a private certifier) and the state of Washington, which requires that all farmers be certified through the state. Inspection fees average $250 per year per farm to support the independent inspection structure. Additional fees are based on sales or individual acreage, depending upon the agency. Proposed rules, implementing the federal OFPA law, were promulgated in 1997 after seven years of revisions. Unfortunately, these rules did not meet the criteria set forth by the private certification agencies, and are once again, in the revision phase, with an anticipated delivery date of 2001. Federal rules will require that all farmers who gross more than $5,000 per year from organic sales must be certified through an agency accredited with the USDA National Organic Program (NOP). The "small farmer exemption" allows for small-scale producers to receive the benefits of premium prices (provided produce is raised organically) while avoiding certification fees. This allowance may change in the future, however, and all farmers are encouraged to join a certifying association to participate in the benefits of sharing information among members. 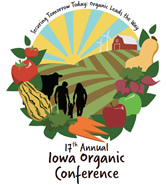 The Iowa Department of Agriculture & Land Stewardship (IDALS) offers a state organic certification program. Farmers may elect to use the state program in place of, or in conjunction with, their private certifier. The state program has the same rules and a similar fee structure as private certification agencies operating in Iowa.